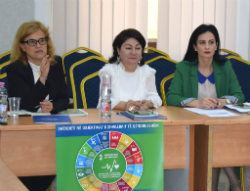 Representing the United Nations Issue-based Coalition on Health, WHO/Europe joined efforts with other United Nations agencies and the Albania United Nations Country Team to support the Government of Albania in adapting the Sustainable Development Goals (SDGs) to national needs and context. They did so using the MAPS (Mainstreaming, Acceleration and Policy Support) approach. During the 1-week mission, the MAPS team met Ms Senida Mesi, Deputy Prime Minister and Chair of Albania’s National Interministerial Committee on the SDGs. They also spoke with other members of the Interministerial Committee and the Interinstitutional Working Group on the SDGs; members of Parliament, all Government ministries, national and international development partners, civil society and private sector organizations; and members of thematic working groups such as the Health Partners Coordination Board led by WHO. Their purpose was to facilitate dialogue, and to support the identification of bottlenecks as well as solutions, accelerators and drivers to enable progress towards SDG achievement. This approach enables the selection of pivotal areas where focused investments may bring high gains across multiple SDGs. Albania is well positioned to achieve strong progress on SDGs by building on the development gains it has made through sweeping reforms. These include the administrative and territorial reform, as well as public administration, judiciary, social and energy reforms. European Union (EU) institutions are beginning to take steps towards accession talks with Albania in recognition of this progress. Both EU accession and the 2030 Agenda for Sustainable Development are key priorities for the Government of Albania. Underlining its commitment, the Government has already integrated the 2030 Agenda into its National Strategy for Development and Integration (NSDI) 2016–2020, established the Interministerial Committee chaired by the Deputy Prime Minister, and produced a report on the harmonization of the SDGs with existing sectoral policies. The Parliament also passed a unanimous resolution in favour of the SDGs, and drafted an action plan for follow-up. Albania is preparing its first Voluntary National Review of the implementation of the 2030 Agenda for the High-level Political Forum on Sustainable Development, to take place in July 2018. Adopted in May 2017, the National Health Strategy was drafted with support from WHO/Europe in accordance with the NSDI, Health 2020, the SDGs and European integration standards for Albania. It is an essential instrument for achieving progress across the SDGs as well as EU accession. It seeks to achieve universal health coverage through quality, timely, consistent and affordable health services for all people in Albania. However, as noted in the European Commission’s 2018 report on Albania and confirmed during the MAPS team’s meetings with stakeholders, further efforts are needed to strengthen governance both at the governmental level and in the health sector. Albania must enhance capacities at the local level; ensure adequate funding and staffing to fully implement the National Health Strategy; and improve the quality and coverage of the data. The MAPS report, expected by June 2018, will draw on these and other recommendations to inform and guide United Nations support to the Government and suggest prioritization of SDGs and targets, taking into consideration Albania’s national development priorities and EU accession processes.